This book by Penny Vincenzi was loaned to me by Mary, like most of the books I've read this summer. Totally and utterly compulsive - I read the first 400 pages in a day. Well, maybe I'm exaggerating a little, but it was a page turner. The ideal beach book - not too heavy (except in weight), but a gripping story, with lots of characters, whose lives become entertwined. It's not a Booker prize kind of book, but it was really entertaining -I might find another one of Ms Vincenzi's books next time I go on a beach holiday. Not that we went to the beach this summer - I read the first part of The Best of Times in our back garden on one of the few sunny days we had this summer (that's how it felt anyway - August wasn't too bad, we had a sunny day every 5 or 7 days. But there really wasn't a day this year when I felt like saying let's drop everything and go to the beach for the day). We went to Dobbins with Padraig and Mary last Saturday evening - my first time there. They have an early bird menu that we availed of - We're not ones for eating late, so it suited us to the ground. There was a great buzz when we arrived at 6:45. A lot of people had decided to eat early! We had a good seat, by the kitchen hatch, and I could see people coming in and out - great for people watching. I had a terrine for starter, with brioche and sweet onion relish - perfect. My main course was called Hake Tempura something something with curry oil. It was essentially fish and chips without the chips. The fish was lovely, with mushy peas. I'm not sure about the curry oil, though - far too subtle a taste for me - I didn't get it at all. Everybody enjoyed their food - Padraig's soup looked very nice - it had cheese in it, which doesn't make for easy eating, but it looked really homely. Brendan had pork belly for main course and declared it excellent. And Mary enjoyed her crème brulée. My sticky toffee pudding was tasty but drier than I had expected, and left me feeling a bit heavy. I should have gone for Brendan's chocolate tart - I had one bite of it, and it was divine. We had a couple of drinks at Kiely's of Mount Merrion afterwards - lovely evening. Expecting to see Padraig there tonight for Full Circle! I mentioned we went to Indian Summer with my parents. The food was as good as ever. My mum had a lamb dish that was particularly nice - I would tell you what it was if I could only remember the name - I know it wasn't the one with spinach, and it wasn't marked as hot, but there was a good kick to it - a real burst of flavour. Indian Summer now have an entrance at the front, which I find is nicer than the back - though you have to walk between the kitchen and the wash-up area before you get into the main restaurant. They also have a new fancy wine and Indian tapas bar at the front. It looks very flash. Must try it some day. We were there on a Tuesday around 6 pm, normally a very quiet time, I'd imagine, but there were another 4 or 5 tables occupied - They are offering a special price Mondays to Thursdays I think - €23.50 for a starter, main course, rice and naan if I remember correctly. Excellent value. There were 2 or 3 restrictions on the menu choices, but most dishes were available, including some of the more expensive ones. I had the Red Snapper Meen Moilee for my main course - that's normally €20.50 just for that dish! Glad to see that the special prices were attracting customers, even on a Tuesday night. At long last, we were able to put our feet up today - it feels like we haven't stopped since mid-August, when my parents were over. It's nice to have a "normal weekend", food shopping, laundry, a walk in Airfield, a bit of art, watching a Buffy DVD (we've just started Series 5, where Dawn, Buffy's little sister, appears out of nowhere - I love that series!). 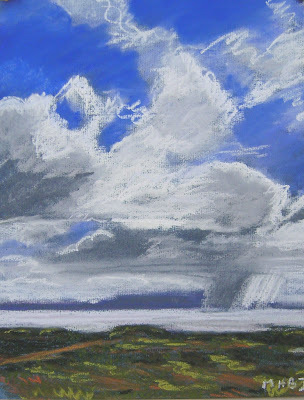 I did another Kerry Sky in pastel, this time in a bigger format. This one is 23x30cm. A bit over-dramatic maybe, but I'm really enjoying painting these big skies full of clouds. Next, I'm going to do the same in acrylics. 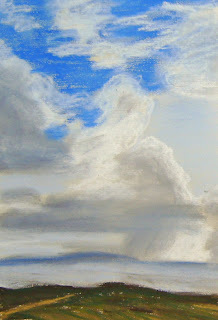 I need to psyche myself up a bit for that - and allow a couple of hours to work the sky and the clouds in one session. I did manage to do a couple of pastel paintings last week, small little ones (18x23 cm). 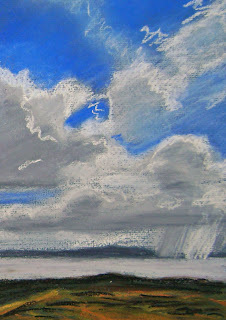 I'd like to do a big sky painting, in acrylics or watercolours. My inspiration is a view of the Kerry coastline from Loop Head in Clare. It's a busy dramatic sky, with a fairly dull foreground. The first one is quite soft, maybe with too little contrast. The second is more dramatic - it was painted on blue paper, which gives the blue sky a stronger feel. Pastels are very handy - they require no preparation, no water, so are ideal when time is short. They are very immediate and satisfying! Sorry for this long break in posts. My parents were over visiting for the last week and we gave them our time. They brought relatively good weather with them - at least it was dry most of the time, and we even managed to eat out in the garden once or twice. Brendan cooked plenty of good food, downloaded jazz music for my Dad and helped him with his crosswords. My Mum enjoyed several trips to Dundrum Town Centre. We went out for a couple of meals (Indian Summer & Queens in Dalkey). So everybody was happy. Catching up on work now! I've just finished reading another book that Mary gave me the loan of - The White Tiger, by Aravind Adiga. It was the winner of the 2008 Man Booker Prize. It's a story of rags to riches in India, but it's very much the dark side of Q&A - no happy ending, and no mister nice guy. Probably a lot more realistic about life in India, and what has to be done to work the system there. I thought it was really good - such a dark story from start to finish, but told with a very humorous voice. While I really enjoyed Slumdog Millionaire, I felt that Q&A, on which the movie was based, was too formulaic, and I couldn't buy into the hero's life and luck. But I can well imagine a real "white tiger", working his way from the poverty of his small village, to the riches of Bangalore. It's quite chilling, but well worth the read. I do love my art training books. Since my birthday, I've been going through a wonderful one, the Collins complete artist's manual. It's a big book, full of practical tips and ideas, but it's also very inspirational, with beautiful paintings and practical projects. I'm learning lots and lots, and it makes me want to paint and draw more (e.g. the foot drawings). 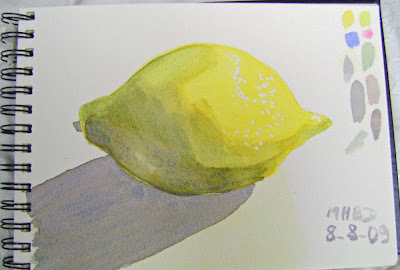 Today, I did a lemon watercolour. It's very simple, with only 3 colours: Lemon Yellow (PY3), Permanent Rose (PV19) and Ultramarine (PB29). I find you can create gorgeous combinations with just those 3 colours. It's a bit chunky - I think I'll have another go tomorrow, to try and blend my colours better, glazing them rather than just adding a bit here and a bit there! I do like the shadow, though. My legs are a bit tired this evening. We did a big walk yesterday, starting at the end of the Bray promenade, and walking part of the cliff walk (I guess we walked about a third of the way to Greystones). I was full of energy and really enjoyed it. Today, we went to Dalkey - it seemed to be the only sunny spot in the city. The sea was quite rough but the light was beautiful. Sorry I didn't bring my camera! We went from Coliemore Harbour to Bullock Harbour and back, with a stop in Queens for lunch (nice burger). Yes, I'm still pursuing that perfect sky. Getting closer. This time, I did the smart thing, and worked wet on wet. It's the smart thing because, in watercolours, if you want a soft blending of colours, you work wet in wet. 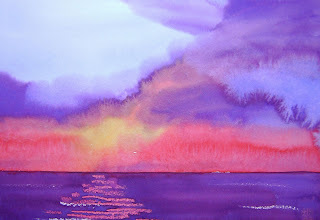 Wet on dry paper gives a chunky, blocky effect, not soft puffy clouds. I discovered this well over a year ago, but my poor little brain obviously doesn't retain as much information as it used to. The trick is to wet the paper with a sponge, rather than a brush - so that the paper isn't too wet and sloshy. The sun reflections in the sea are a bit too obvious - a pyramid reflection isn't exactly subtle. I did another one afterwards, where I got my reflections much better, but the sky didn't work so good, because my paper was too thick (300 gsm) I think, and it absorbed the water too much (+ the colours weren't great). The reflections were done by rubbing a white candle against the paper. When you paint over the wax, the water can't get through and the part where the wax was remains white (or pink if, like me, you did a glaze before applying the wax). It's called a "wax resist". I quite like it. Not sure if I'm supposed to take the wax off afterwards or not. One book doesn't mention it, another one says to take it off with a cool iron, which I tried, but it seems like too much trouble if you can leave it on. Our choice was Moon, showing at the Irish Film Institute. We'd heard a review on the radio, and it sounded like our kind of movie, science fiction, but not Hollywood. If you liked Solaris (I must get the book for that actually - it sounds very interesting), you'll like this too - more atmosphere than special effects, and a very good story, following Sam Bell, a technician on a 3-year contract with a Lunar mining station. Sam Rockwell, the actor who plays Sam Bell, is excellent throughout. I won't say much more than this, as I don't want to spoil it (don't read the synopsis or the "about" section on the website - it tells you too much about what's going on). It's one of these movies that we'll probably own on DVD, perfect for watching again on a rainy day.